This blogpost has been a long time coming. 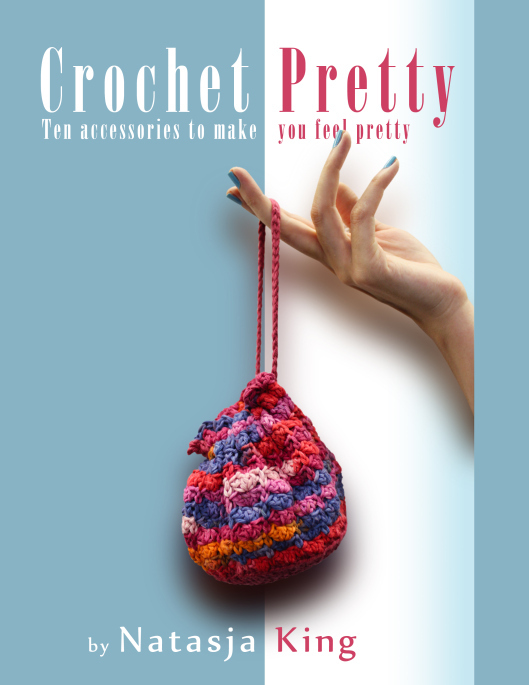 I found out about this handy iPhone app in the Spring/Summer edition of SimplyCrochet magazine way back in June but never got round to blogging about it. It’s August now (can you BELIEVE it?!) so it’s about time I tell you about the app. 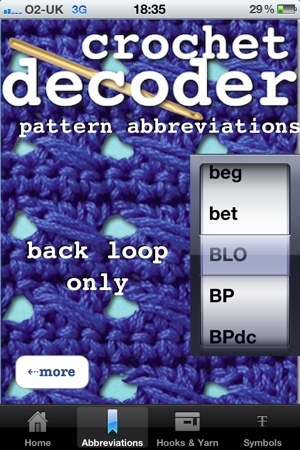 The app is called “Crochet Decoder” and is made by Sugar Coded Apps. You can download from the Apple iTunes store for $0.99. 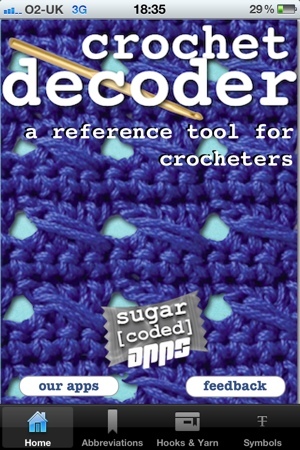 They say on the home screen it’s “a reference tool for crocheters” and it really is. 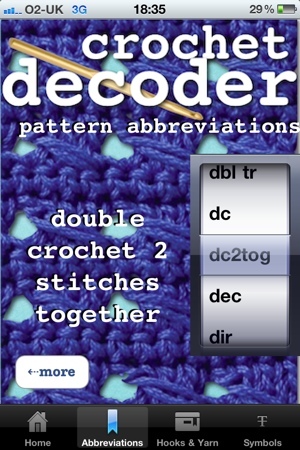 I think most crocheters will have a book or a favourite website that could give you all the information the App has, so I don’t think Crochet Decorder will take the crochet world by storm or anything, it’s just handy to have. (Especially when you’re in your LYS expanding your stash, trying to read the yarn labels). 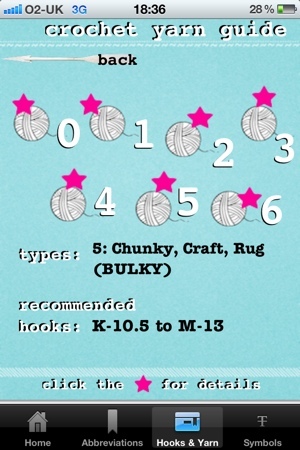 3) be a yarn guide, showing you the commonly referred to name of a yarn weight (in this case, weight category 5 of the Standard Yarn Weight System) and the suggested hook size for that weight. 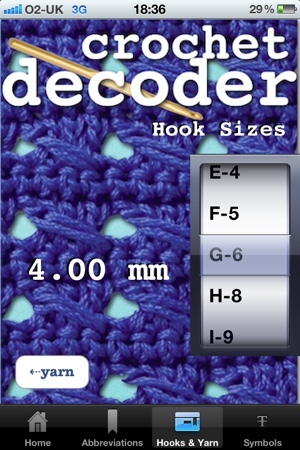 If you think of your crochet hooks in mm’s, you can of course use the screen above to see what that would be. And that’s basically it. A quick, handy reference guide on your iPhone. I have to admit I haven’t used it yet, but it’s nice to know I have it. 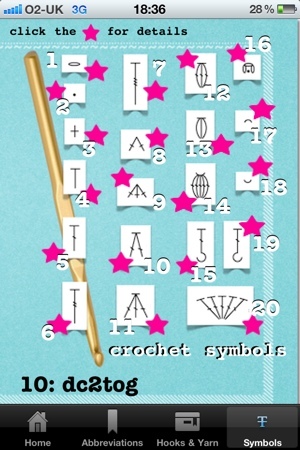 Now, if someone could only think of an App that can weave in ends and crochet the first row after a foundation chain! I normally google it and go through a few websites to get the info, but this is really neat and handy! How handy is that? 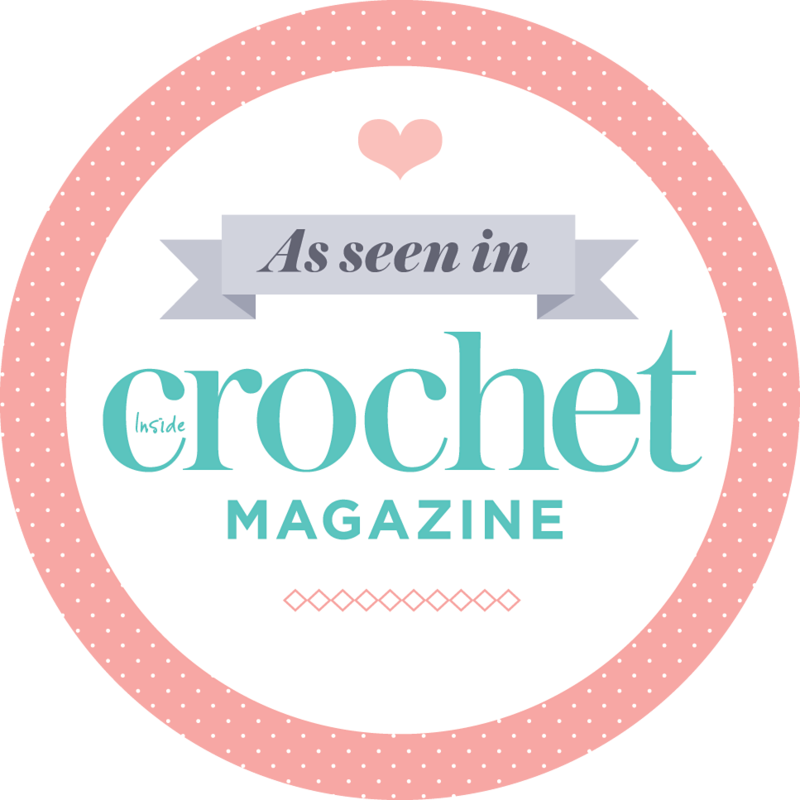 The mysteries of crochet… unravelled 😉 Thanks for sharing!